Right from the start, the staff at the host university, TLÜ, did their very best to welcome every Erasmus student. Out of the 7.500 students in TLÜ around 10% are international students, so they also have some experience in that field. The first days were dedicated to the Orientation Week, where all useful and less useful information about living in Tallinn and Estonia in general, as well as studying at TLÜ was given to the incoming international students. The courses I attended were all held in English. I attended seven classes, of which four were only for Erasmus students, while the other three were also for locals. Being the only one, or sometimes one out of two Austrians in my classes, this gave me the opportunity to get to know and compare other school systems from around Europe. This was also supported by the lecturers, who encouraged a lot of open discussions and exchange of ideas. In general, the courses were quite student-orientated and lecturers tried to involve students as much as possible, even in a course with a group size of about 50 students. Apart from this course, the group size was around 10-15 students. Estonia is a very modern, technology- and computer-savvy country, the contents of the classes also contain a strong focus on technology. Apart from that, I learned in my class about transition processes in different countries, youth work, various aspects of child development and much more. One of my favorite courses was the so-called ELU project; this project encourages groups of students to develop something on their own. We created an international teacher’s counseling skills self-assessment test by translating and modifying an existing Estonian version. To gain practical experience in teaching, the host university offered a course called “Practice in Education Innovation”. The lecturer sent me to a school to gain an insight into how teaching works in Estonia. As my Estonian is less than poor, I had the chance to go to an English speaking International School. This school is part of an international network, that links their curriculums and just adepts them to the respective countries. It is a private school and attended by children from many different nationalities. I was surprised about the level of English spoken by the children, starting at the age of six. The class sizes were between eight and fifteen children. After discovering the whole school, it’s classes and getting to know different teachers, I spent more time in the fourth grade. The class consisted of nine children, three girls, and six boys. I could observe the lessons in several occasions and got the chance of working with the kids as they were planning out a play. But of course, an Erasmus semester does not only consist of studying. It is also a chance to get to know new cultures and travel. Which I did. During the last five months, I traveled to Sweden, Finland, Russia, Latvia, Poland, Ukraine, Hungary and Slovakia. These trips allowed me to see the beauty of some parts of Northern and Eastern Europe, their people, their culture, their food. But I did not only travel around Europe but of course also in my host country, Estonia. It is a beautiful country, consisting of spacious natural landscapes (around 50% of Estonia is covered with forest), beautiful beaches, some relics from Soviet times and quite a lot national parks. As it is a rather small country, traveling gets quite easy with buses, trains, or just by renting a car for one or two days. Another important part of my Erasmus stay was the social life. Meeting new people from all around the world is always interesting. Especially when they are smart, open-minded, the same age and most of the time happy, like the Erasmus crowd. I have not only met international students from around Europe, but also from as far away as USA or Canada in the West, and Bangladesh, India or South Korea in the East. There is so much to learn about diverse cultures and countries by just speaking to their inhabitants. Also, hanging around with people in the last five months has led to many wonderful friendships and moments that I will never forget. I can only recommend Erasmus to every student. And yes, Tallinn is an amazing destination for your Erasmus. 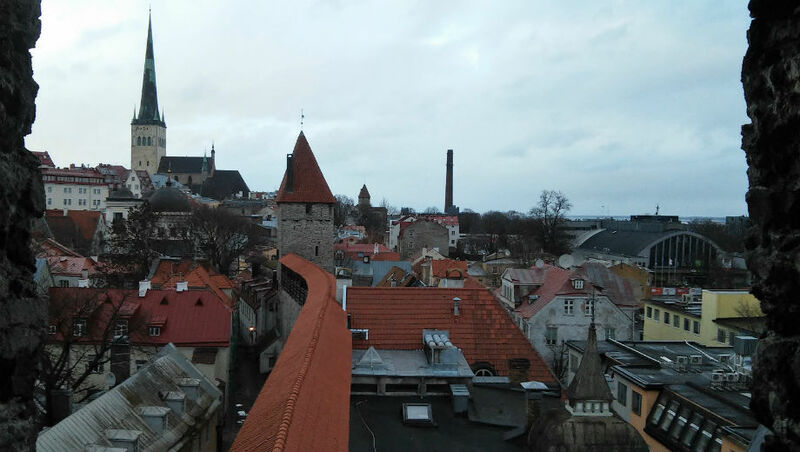 If you plan to come, try to get on the “Around Estonia” trip by Mareti at the beginning – so you get to know a little bit about Estonia and have more information to plan out your further travels. Don’t forget to go to Helsinki (it’s just two hours by boat) and take the chance of being so close to Russia (6h to Saint Petersburg by bus) to go there. In Tallinn, visit the old town (obviously), the Kadriorg park and the TV tower. My favorite places in Tallinn probably were Linahall and Pirita Beach (you can go swimming there, also in October). To eat out I can recommend Kompressor and the pasta in Must Puudel, which is a very nice café by the way. A savior in long nights is the Turkish Kebab on the corner of Vaia and Vana-Viru in the old town. The kebab is far from what we are used to in Austria, but it is open 24/7 (and they sell cigarettes). The city’s most famous (and most expensive) restaurant is Olde Hanse, serving medieval food. The old town also offers a vivid night-life. There are a lot of cool bars, my favorites being the Red Emperor (go there on Mondays: karaoke nights), Shamrock (karaoke every night), Nimeta (sports bar) and the Highlander (Scottish pub). On Wednesdays, most of Erasmus students gather in Club Münt (all drinks 1€ all night). On Weekends, the bigger clubs, like Studio and Hollywood are more interesting. If you’re more into raves, you should check less known places, like Peatus and Hall. Or just ignore me and make your own adventures. All in all, Erasmus is a great chance to explore the world, make friendships, learn from diverse cultures and gather unforgettable memories.